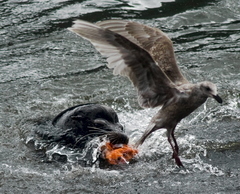 PORTLAND, Ore. -- Columbia River treaty fishing tribes are urging the states of Oregon and Washington to apply for new permits to kill sea lions that eat salmon bottled up at the fish ladders over Bonneville Dam. The tribes issued a statement on Thursday saying the science is clear that sea lions eat about 20 percent of the spring chinook run on the lower Columbia, and the removal program has been supported by a special taskforce. NOAA Fisheries Service this month lifted the permits while a challenge from the Humane Society of the United States works its way through court, but urged Oregon and Washington to apply for new permits for next year. Oregon has already said it will.